It’s not over til the fat lady sings, and I’m getting fat. But the adventure never ceases to surprise. Each city/town/pueblo we visit seems to be unique, diverse, and better than the last. 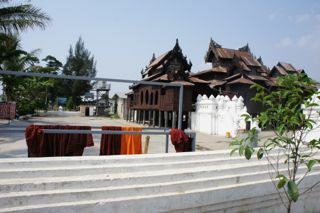 Now we are on Inle Lake (20 miles long, 3 miles across) which is the Shan capital of Taunggyi. It’s not easy to access. No roads, only canals and motorized canoes called Hlay. There are always some clinks in the thread of perfection - like the electricity keeps going off, or, no hot water, or, no air-Conditioning, or ,as here at Aureum Palace Resort and Spa on Lake Inle, there’s no internet. But the negative is as much a learning tree as the positive. I thought I was almost Buddha-ed out but one of the best experiences of this trip happened on the road to the dock where a boat waited to cart us to the hotel. We started as the hot sun rose in Bagan on a one- stop Yagon Airlines propeller plane. The pilot seemed to be driving a motorcycle not a plane. Took off quickly before you could get your prayers in. Fly at a low altitude for 15 minutes. Ok. Time to go down. No coasting along for 20 minutes like landing in Memphis airport. Five minutes on the ground in Mandalay. Bump. Sway sway sway. Screech. Whirl around to go back down the runway. Stop. Passengers departing in Mandalay leave. 5 minutes. Gas. (told to unfastened seat belts, in case I guess, there’s a fire). 5 minutes. Load a few more passengers. 5 minutes. Door closes. Grind. We are off for, love this name, He Ho Airport. 20 minutes. Couldn’t understand a single word in Burmese or English, if there was one Down in a spit. Weave Weave. This is a tiny airport. Off the plane through the rear door. Motors gun before we get to the airport. There is one plane a morning that puddle jumps from Yangon, to Bagan, to Mandalay, to He Ho, and back to Yangon. We will have done the route when we leave tomorrow. He Ho Airport - wow. 10 degrees cooler. Nice breeze. Outta there in 10 minutes. An hour to the hotel, we are told. I buy a hat for $2 to keep the sun off my face. This area 3000 feet high is a huge valley surrounded by green mountains overseen by a chief spirit Koemyoushia who favors the number 9 - there are 9 mountains, 9 caves, 9 forests, but one cannot tred on that number. So if you are in a vehicle with a group of 9, you must find a stone, give it a name as if it is a person, so there are 10. I’m trying to figure that one out. The people who inhabit this are are called Shan and they eat a lot of things made of rice - from sticky rice to rice cakes, rice puddings, rice cookies, giant thin rice crackers, rice curries and sticky rice squares (red or white) which are fried and then dipped in sugar. Those are good. e worship area with the names of hundreds who have donated to this monastery. I felt in my heart that after we have tracked through so many temples and pagodas that are Buddhas holy places, I needed to give a thank offering, and felt it was okay with my Lord Jesus. So I donated $100. The monk smiled (you don’t see monks smile often) and said he’d give me 5 Buddhas. I said No, No. The money is to help the monastery. 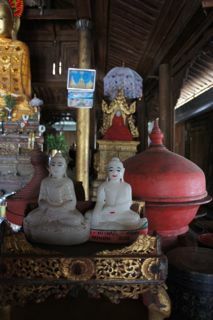 So there happened to be left (grouped with large “begging bowls” the monks use daily to get food) one white marble sitting Buddha, a bit oversized, but with a smile on his face and I said that would do. So we went to the highly decorated temple room and walked through (barefoot, of course) until we find the auspicious space. There was a wall with only 3 niches. I immediately thought: Holy Trinity. Tink told the monk of the parallel. The monk smiled again. 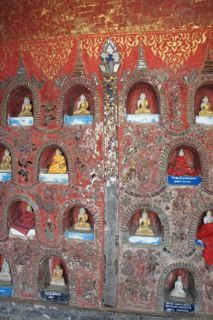 He decided that the Buddhas on each side would be named for my two guides, Jim and Tink. We all got joy in that. And I felt I had given thanks to the great Buddhas who inhabit this part of the world. Still more good to come. A stroll through the real people’s market, villagers bring their produce down for a roving 5 day market, introduced me to many new tastes and crunches. I sample. Rice cakes. Big thin crackers. Spices - no peppers please. A mango - the richest, most fragrant I’ve ever had. We don’t get mangos like this in the US. 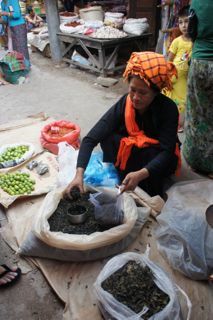 Women in brightly colored turbans sit on mats selling all kinds of produce. It’s a busy place, always, but speaks loads about the people in that region. A thin teak boat was waiting for us - 5 seater. We used 3 and there was the driver who has to stand at the back holding the motor up or on the water, I couldn’t tell, and guiding us through bustling canals into the beautiful, enormous Inle Lake. What a treat! It was about a half hour to the hotel through rice fields and floating farms, being created because of the massive hyacinths growing in the water. On top of groups of hyacinth leaves, winding stems and flowers, the farmers place piles of green grass - it is really seaweed which they pull up from the lake and carry in their boats to their plots - then cover that with dirt and on top of that they plant tomatoes (50 per cent of this country’s production is right here on the floating gardens. String beans, okra (called lady fingers) and other vegetables thrive in this rich dark soil. It’s amazing way to use abundant water in this tremendous lake. Each water farmer has about an acre plot on which a little shed on stilts sits so they have a place to rest and eat during the day. It is their plot for as long as the farmer lives, but it is still “owned” by the government. The major crop on real land in this area is sugar cane. We passed men fishing with their legs, an oar and the net. They wrap their legs around the oar, attached to one end and vertically, then swish it around to scare the fish into the giant V net. 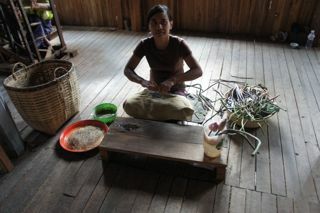 Very primitive but very productive, even though water is low at this point waiting for the rainy season to begin in May. The boat driver weaved us through masses of hyacinths were gorgeous large light violet flowers bloomed, many on a stalk (sort of a blown up version of our spring hyacinths), and he complained how it’s difficult to get to different places because the lake is so low. Finally we arrived an impressive piece of architecture on stilts sitting against a mountain. This was Aureum Palace and resort. The rooms are villas sitting on stilts in the water, although it’s mostly rich black mud right now with tall green grass still thriving. From here on, all transport for two days is by boat. I love it. I’m a frustrated boat person. 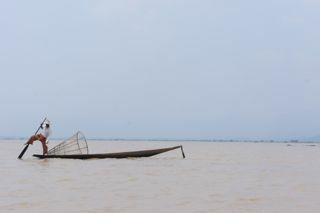 Immediately we launched on the boat (called a HLay) for about an hour’s ride - there are 200 villages around this lake - to lunch at a “tourist” restaurant, Golden Kite, on stilts, as is everything including pagodas and temples. The people who meet and greet you all over this area are super friendly and worry to help you get up and down the tall wooden steps and be refreshed with water. I was so thankful for the cooler temperature and the wind in my face on the boat. I also learned to balance a big umbrella in strong wind from the propelled boat, a requirement to fight sunburn . After a Shan style lunch (we stayed away from the American-European side of the menu,) we were off to a weaving village, another half hour away. As the boat pulled up to the stairs I could hear the clack clack clack of many looms in use in many houses. 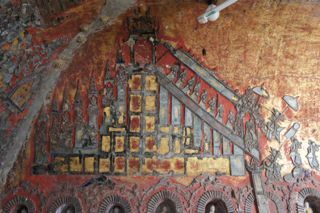 This place is special not only for silk weavings, but for lotus weavings. Lotus flowers? The stalk of the lotus leaf and flower contains threads within which can be pulled out, dried, and used for weaving. It’s tre expensive, but it’s a beautiful thing only used for scarves and fabrics, not in local fashions. Who would have thought of that? The longhees in this part are mostly of cotton mixed with some silk but in the Shan district they have distinct embroidered areas. Here, finally, I was able to purchase needlepoint yarn. I’ve looked every country every place, no one would sell it at the silk factories. I was even able to get a spindle of lotus threads. Back down to the water for a special stop at a “cigar” making shop. 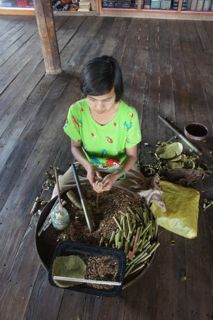 A young girl carefully mixes up the ingredients and rolls them in a thin short cigar - more like a cigarette. It’s what they do with Cheroot. The stalk is shredded, mixed with local tobacco, brown sugar, honey and tamarind pulp. Everything is left to dry and then it is rolled into something to smoke. Do they put all that sweet stuff into regular cigars? 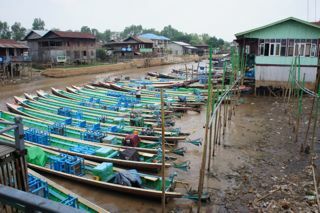 A good long boat trip got us back to the Aureum Palace, where I had signed up for a Thai foot massage. Had to walk a half mile on wooden plank paths on stilts to get there.